Every once in a while, a movie becomes a legendary flop, and 1995’s Waterworld stands as one of cinema’s biggest duds. It came with all sorts of budgetary and production problems and received a pretty chilly critical reception. Audiences were a bit more forgiving, as the flick made $88 million in the US, but it still went down as a famous bomb. Which I didn’t think it deserved. I saw Waterworld back when it ran theatrically and actually thought it entertained. However, I’ve not seen it for more than 20 years, so I figured it was time to give it another look. The flick takes us to a dismal future society in which the ice caps melt, water covers the earth and factions struggle for survival. Led by the Deacon (Dennis Hopper), a nasty clan of pirates called the Smokers rules the seas by force, and they attack anyone who stands in their way. All the survivors dream of finding dry land, though many believe its existence to be a myth. We meet a loner simply called The Mariner (Kevin Costner). He seems to thrive more than others, which probably stems from the facts he’s evolved into a man with gills and webbed toes. This lands him in trouble with those who view him as a dangerous mutation, and one clan imprisons him. WaterWorld opens with a sequence in which Costner drinks his own filtered urine. Man, if that’s not a metaphor for this flick’s legacy, I don’t know what is. It also begs the question: if this society’s scientists could figure out how to turn pee into drinkable fluid, why couldn’t they do the same with salt water? Granted, one could hurl that accusation at many summer blockbusters, but Waterworld seems more muddled than most, largely because of its attempts to relevance. The film injects a pretty flaccid ecological message, primarily via the destructive Smokers. They misuse natural resources as they slash and burn their way across the planet – not too subtle, is it? Little nuance appears elsewhere, so expect a slew of ham-fisted messages across the film’s 135 minutes. “Broad and campy” dominates, though, and that trend gets tedious. Majorino also creates one of cinema’s all-time most grating children. Admittedly, she’s supposed to be irritating, but she goes above and beyond to the degree where we never embrace her. Even after we’re supposed to accept/like Enola, we don’t because she remains an annoyance. 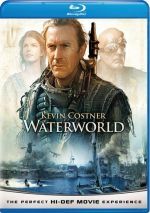 Waterworld appears in an aspect ratio of approximately 1.85:1 on this Blu-Ray Disc. The transfer usually satisfied, but it never excelled. Sharpness was generally positive. A little softness interfered at times, primarily due to the light edge haloes that cropped up through the flick. Nonetheless, the image normally provided good delineation. I saw no issues with jagged edges or shimmering, and source flaws were absent. Some parts of the movie looked abnormally grainy, but I witnessed no specks, marks or other distractions. Waterworld went with a relentlessly dingy palette. Rusty browns dominated the affair, as it rarely demonstrated more dynamic hues. This made the colors seem flat, but they remained fine within the parameters of the production design. Blacks appeared dark and full, while low-light shots offered acceptable to good delineation. The transfer fell to a “B-” but the image was usually positive. The DTS-HD MA 5.1 soundtrack of Waterworld proved more consistently satisfying. My only complaint about the soundfield stemmed from the manner in which the elements meshed. At times the various components didn’t blend together particularly well, so the film took on a rather speaker-specific vibe. This wasn’t a terrible flaw, but it meant that the audio wasn’t as seamless as I’d like. Audio quality was also positive. Speech appeared natural and crisp, without edginess or other distractions. Music got a little buried in the mix and occasionally lacked great pizzazz, but the score was usually pretty solid; that side of things offered generally solid vivacity. Effects showed nice clarity and definition, and they also boasted fine bass response. The track didn’t work well enough to enter “A” level, but it still seemed good. In terms of extras, Waterworld includes a trailer - and that’s it. Does Waterworld deserve its status as an infamous flop? No, but it also shouldn’t be viewed as an unjustly maligned classic, as it offers a mix of thrills and idiocy. 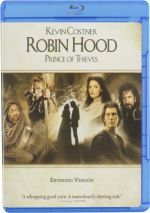 The Blu-ray provides mostly positive picture and audio but lacks supplements. This turns into a generally good presentation for a spotty film.